TACA had a complicated series of owners throughout its history, however these rarely stopped it from achieving and it was something of a trendsetter during the 50s and 60s as it introduced both the first prop-jets and true-jets in Central America. Its BAC One-Elevens would have long careers with it and form the backbone of its survival and success into the 1980s. Transportes Aereos de Centroamericano was founded rather bizarrely in 1931 by a New Zealand pilot in the Royal Canadian Air Force - Lowell Yerex, in Honduras. Yerex dreamed of creating a network of TACA's throughout Latin America but though initially successful political machinations with Pan Am and others as well as various dictatorships saw all the airlines except the one in El Salvador disappear. In 1940 Yerex sold control of the company only to be forced out in 1945. 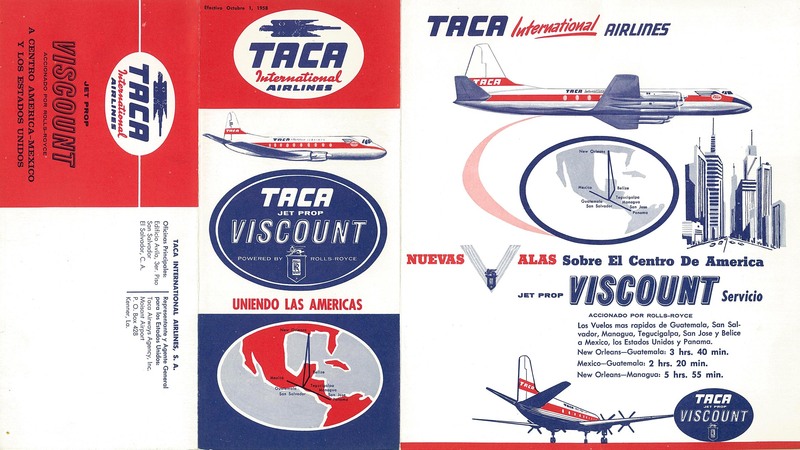 TACA acquired a local San Salvador based airline in 1947 and it was this which would go on to form the future airline TACA International. When Waterman Group acquired a 35% shareholding from TWA in 1949 they injected funding to keep the airline afloat and created a new New Orleans based holding company TACA Corporation to manage the airline. TACA S.A became TACA International at the same time. Ownership passed briefly to McLean Industries in 1964 before TACA was on sold to Southern Industries Corporation. They financed TACA’s introduction of the first turbine engine equipment in Central America when in 1957 a Vickers Viscount 754 was leased from Philippines. Services began on December 2 and were an immediate success. A replacement Viscount was acquired in April 1959 as YS-11C, having been purchased from Lanica. Another was added in 1964 and after YS-11C was sold in May 1967 a last Viscount was acquired in January 1969. The Viscounts helped turn TACA into a technical leader in the region and TACA was obviously pleased with the British product as when it came time to once again set the pace in the region it turned to the British BAC One-Eleven. The first aircraft YS-17C was named ‘El Centroamericano’ and first flew on December 5, 1966. YS-18C arrived in February 1967 and was named ‘El Salvador’. The jets seated 74 passengers and opened jet operations on routes from San Salvador to other regional capitals, the Caribbean and as far afield as Miami and New Orleans. A third aircraft, a series 409, was acquired in April 1973 when LACSA of Costa Rica's ‘El Tico’ was purchased and became YS-01C 'El Izalco'. 01C was sold to Rolls Royce Bristol in 1979 and the aircraft had a long and unusual subsequent career. She was converted to a combi with a large cargo door forward, a load spreading plywood floor and seating for 39 aft. Between August 1979 and early 1994 she operated from Bristol Filton to Italy and Germany in support of the Panavia Tornado programme. The One-Elevens had built in stairwells and were well-suited to the rough and ready operating conditions found at many TACA stops. They provided a sound foundation for the airline, which despite them was increasingly financially troubled. The late 1970s were especially unkind to TACA but the Kriete family took majority control and Ricardo Kriete worked closely with his old schoolfriend Federico Bloch and began to turn it around in 1979, only for revolution to breakout in El Salvador. Traffic dwindled, interest rates sky-rocketed and tourism vanished but the carrier somehow continued in operation even adding its first 737-200 on lease in 1978. The BAC One-Elevens had operated throughout the 1960s and 70s in a version of the rather sterile blue and white scheme that the Viscounts had worn but the first 737 introduced a modernized version with two blue stripes and the return of the TACA stylized Macaw logo of old. Sometime in 1982 this livery was replaced by a colourful rainbow scheme making the most of the airline’s tropical location. The airline was still effectively a US one with its homebase in New Orleans, where maintenance was also done and with many of its pilots US and members of the American pilots union ALPA. Gradually the carrier switched its base and operations to San Salvador aided by the removal of a curfew at the airport. This helped cut costs and by 1983 the airline was profitable. Both were sold to Winchester Aircraft Financing. YS-17C became G-BSXU before on-sale (along with her sister) to Kabo Air where she became 5N-BXR in late 1991. She was however broken up not long afterwards in 1993. YS-18C became G-BSXV. In November 1992 she was also sold to Kabo Air of Nigeria and became 5N-KBW. She was withdrawn from use after a crash in May 2002. TACA itself was run by a savvy group of managers who began to invest in several other local airlines most notably Costa Rica's LACSA and Guatemala's Aviateca. These airlines would eventually all merge under the TACA name with a new fleet of A320s. TACA would continue to grow in places as far afield as Peru but in 2009 it decided to merge with the resurgent Avianca and finally in May 2013 the TACA name disappeared. Nonetheless it was the rugged pair of One-Elevens that established TACA during the 1970s despite the odds as a reliable international flag carrier. Where can I buy model airplanes for the old Taca Airlines? These are long ago sold out so you'll have to keep an eye on eBay and the second hand market.